Thessaloniki is the second largest city in Greece and administrative center of the Aegean Macedonia. Along the town is the mouth of the Vardar River, which empties into the Gulf of the Aegean Sea. Thessaloniki is located 300 km south of the Bulgarian capital Sofia. The city airport has a convenient railway station which has regular services from Sofia. 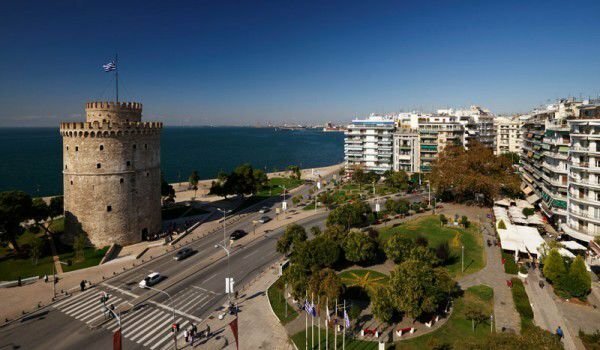 Thessaloniki and its amazing architecture and historical monuments are listed as a UNESCO World Heritage Site. The history of this city is inherently linked to the female principle. Founded by the Macedonian king Cassander in 315 BC, which decided to call the city after his wife Thessalonica. She was the sister of Alexander the Great. Thessaloniki was the capital of one of four Roman provinces in Macedonia after its conquest by the Romans. In his second visit to Macedonia Apostle Paul preached in the local synagogue, which was mainly for the Jews of the area and had set the early Christian church and brotherhood. Because of dissatisfaction with local Jewish leaders, he left town and headed to the northwest, in the city of Veria. Thessaloniki is one of the important commercial centers of Byzantine. There were born the Bulgarian educators St. Cyril and Methodius. In 1204 Thessaloniki was conquered by the Crusaders who participated in the IV Crusade, and was proclaimed the capital of Thessaloniki. In 1207 the Bulgarian King Kaloyan was at the doors of Thessaloniki and is on track to release the city, but was betrayed by his wife and killed. In 1224 the city passed into the possession of Epirus. In 1235 King Ivan Assen II was a subject of Epirus whom became his vassal territory of Bulgaria. After the death of King Ivan Assen II the Bulgarian state weakened and in 1246 joined with Thessaloniki. Later, when the invasion of the Ottoman Turks in the region were due to failure to defend Thessalonica Andronikos III, Palaiologos sold it to Venice. The city remained in Venetian hands until 1430 when it was conquered by the Turks. 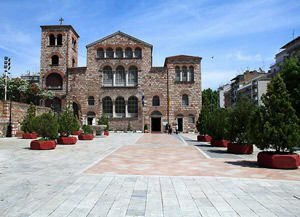 In 1492, after the persecutions against Jews in Spain, many of them settled in Thessaloniki. Thessaloniki became one the largest Jewish centers not only in the Balkans. In 18th - 19th and early 20 century the majority of the population of Thessaloniki were Jewish. In Thessaloniki there are printers and Jewish schools, one of the largest industrial enterprises in the Ottoman Empire were owned by local Jews. During the Ottoman times Thessaloniki was one of the largest cultural and educational centers in the Balkans. The city remained within the Ottoman Empire until 1912 and was named Salonika. During the Balkan war the Greeks were ahead by only one day and Bulgarian troops managed to establishe the Thessaloniki and Greek government mandate. After the Second Balkan War, Bucharest signed a contract under which Thessaloniki was sent to Greece. Tens of thousands of Bulgarians were banished forever from their homelands. Closed was the Bulgarian Men's High School of Thessaloniki, as the girls' school and Bulgarian and other cultural institutions. During the World War Thessaloniki was occupied by the Anglo-French troops and became the main base in their war against Bulgaria and its allies. The city established a provisional government headed by Eleftherios Venizelos, who is on the side of Franco-British allied forces, despite the desire for neutrality of King Constantine I. In the great fire of 1917 most of the city was destroyed. Hence the mass of the Jewish population, lost their possessions in the fire and emigrated. Many of them headed for Palestine, France and USA. The population grew rapidly after the war of 1922 between Greece and Turkey and the following Anatolian catastrophe. Greece lost Anatolian coast and the town of Izmir. Thousands of refugees from those areas settled in Thessaloniki, as they brought their customs and traditions it has had a major impact in further development of the city. Rotunda of St. George dates from the third century and is considered the oldest church of the Thessalonians. It was conceived as a mausoleum for Emperor Galerius, but did not perform this function. Constantine the Great made it a church. In the 15th century the Turks turned it into a mosque and from this period is preserved as a minaret. Another remarkable Church is the St. Mary which was made with hands. Be sure to visit the Museum of Philip of Macedonia, where you can see his battle armor and weapons, and items removed from the tomb of the ruler. In the museum are exhibits and ornaments of his last wife, found in 1977 located 60 km from Thessaloniki in the town of Vergina.